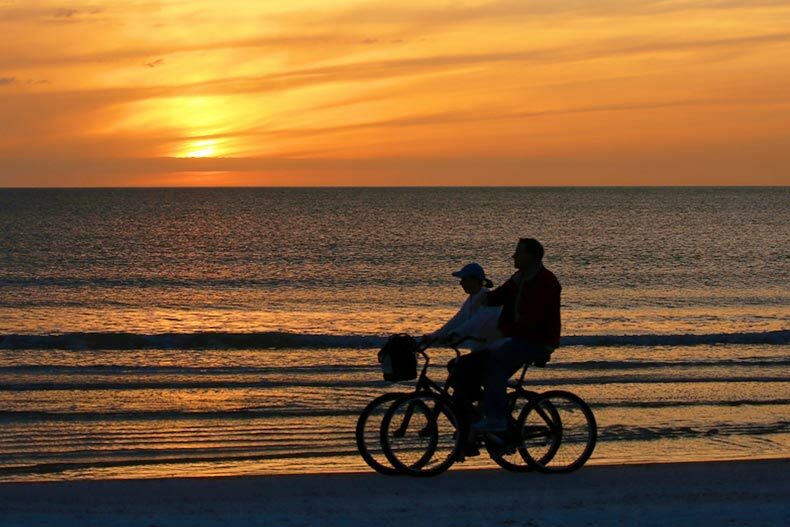 Sunset bike rides on the beach are a Fort Myers specialty. Thomas Edison was a winter resident of Fort Myers, and that’s why the Florida city received electric light in 1898, sooner than most southern regions. Locals didn’t love it because it kept the cows up at night. No longer a cow pasture, Fort Myers is one of the sunniest spots in Florida and its beaches also have the most diverse collection of shells. This city on the southern Gulf Coast makes a superb home – just ask the 68,000 residents currently living there. If you’re looking for your next home, and you want to be able to enjoy lots of outdoor activities and warm weather, check out one of these communities in Fort Myers and the surrounding areas. For golf, gorgeous landscaping, and low-maintenance 55+ condo living visit Seven Lakes in Fort Myers. This community of 1,096 condos and attached villas provides a luxury lifestyle without bullying your budget. More than 30 floor plans are available with one, two, or three bedrooms. Available living space for these resale homes is between 700 square feet and 1,600 square feet. There’s an 18-hole championship golf course as well as a putting green and chipping area that residents can access for free. There are also tennis courts, shuffleboard courts, and six outdoor pools. Popular clubs and activities include water aerobics, photography, quilting, and line dancing. There are also social hours, concerts, and movie nights held regularly in the clubhouse. Plus, there is community transit to nearby shops, grocery stores, and restaurants if you don’t feel like driving. There’s a clubhouse director at Cinnamon Cove, a gated 55+ community in Fort Myers, who will help you fill up your social calendar with club activities, group outings, and communal fitness classes. With 10 outdoor pools, six shuffleboard courts, as well as a fishing pier and three fishing lakes, it’s easy to find something to do in this community. Residents who love the beach can jump on the Fort Myers Beach Trolley, which stops outside both of the gates at Cinnamon Cove. Buyers can choose a single-family home, condo, or attached villa in this community of 770 properties. Plenty of floor plans with two or three bedrooms are available, and they are sized between 931 and 1,833 square feet. Just outside of Fort Myers is Alva, where you’ll find 575 new and resale single-family homes available at Cascades at River Hall, a gated 55+ community providing waterfront living. Alva is close to the Fort Myers International Airport as well as lots of great hiking and nature trails. With modern floor plans that include dens, garages, and large layouts, buyers can easily find a property that meets their budget and lifestyle. The properties range from 1,572 square feet to 2,638 square feet, and you can buy a two-bedroom model or a three-bedroom model. Amenities start with two large clubhouses and a private golf course. There are also pools, tennis courts, a state-of-the-art fitness studio, and miles of trails for biking and walking that wind through the beautifully landscaped community. Happy hours and community lunches and brunches are frequent, and residents also get together for book club, investment club, and scrabble. Home buyers who want a 55+ high rise condominium experience that includes a low-maintenance lifestyle and lots of amenities should consider River Towers in Cape Coral. Two eight-story buildings house only 108 units, which means residents know each other and enjoy spending time together in the clubhouse, at the pool, or out on the town in Cape Coral. Most units are two bedroom-two bath homes that come with a parking space. There’s a library, card room, and billiards room at River Towers. Residents enjoy the outdoor pool, shuffleboard courts, and Tiki hut, as well as the fishing pier and boat dock. The community is within walking distance to Riverfront Park and all of its scenic beauty and bike paths. The gated community of Magnolia Landing in North Fort Myers has no age restrictions, so it’s an ideal place to consider living with extended family. There are 1,100 single-family and attached villa homes available new or for resale. Five models with dozens of floor plans offer buyers a lot of options when it comes to size and space. Amenities include an 18-hole Gordon Lewis championship golf course as well as a 10,000 square-foot clubhouse and an outdoor pool with a sundeck. There’s an aerobics room, a fitness center, and a driving range for residents to use. Holiday parties, seasonal events, and special activities like fashion shows keep all of the locals active and engaged throughout the year.